The Weather Channel featured a visually frightening presentation of the Florence hurricane potential scenario. Showcasing what might happen to a Carolinas neighborhood, the presentation used some extremely vivid IMR weather visuals. In an attempt to portray the danger of storm surge as vividly as possible, weather reports have turned to Mixed Reality technology. The message was primarily directed at Carolinas residents unwilling to part with their homes. The IMR weather report was so shockingly realistic, the viewers agree, that no info, map, or wind-blown tree pics quite match the effect. ‘But this is just how it (storm surge) looks like on a map. We can show you what this could look like if you were to find yourself in this scenario’, the meteorologist Erika Navarro of Weather Channel says while her surroundings quickly shift into an immersive Mixed Reality generated visual demo. She is left standing in the center, while an Unreal Engine neighborhood stretches around her. The IMR weather demo quickly turns towards scary. As she explains the effects of ‘6-foot range’ level, the CGI water rises above her head ready to engulf any living creature unlucky enough to oppose it. The IMR weather video simulates the water picking up cars, the wind effect, and later on even fish swimming around. Undoubtedly dangerous, 6 foot water is still not absolutely lethal. But zooming out, the report turns to its most frightening. ‘This is an absolute life-threatening scenario’, Navarro goes on as the water level rise to 9 feet. ‘This water is through the first floor of your home. So if you find yourselves here, please get out’ Navarro urges North and South Carolina residents. 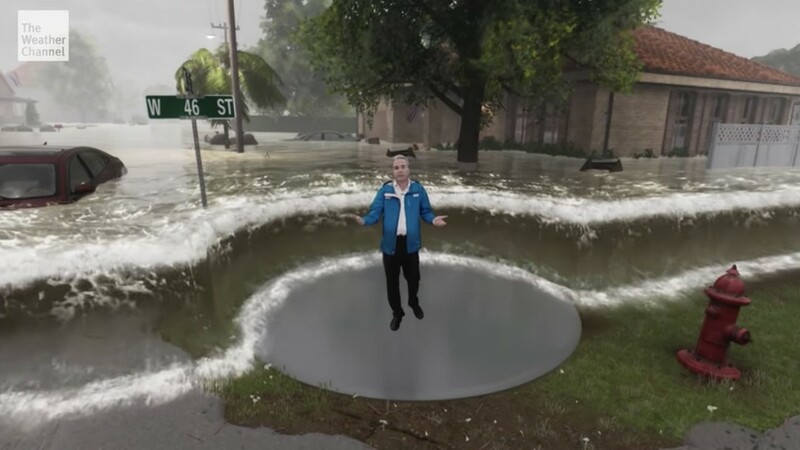 2018 is the third year that Weather Channel has used Mixed Reality. However, April this year saw them teaming up with The Future Group promising never-seen-before IMR weather visuals on screen. The base engine for creating MR effects is the Unreal Engine. ‘Using the Future Group’s Frontier powered by Unreal Engine for weather broadcasting’, Design for the Weather Group Vice President Michael Potts argues, ‘has never been done before’. The initial demonstration of this collaboration was a spectacular 7-minute video of what would happen if tornado hit the Weather Channel studio. We see reverberations of that video in the new Florence hurricane demo. Both present an attempt to influence, and potentially save lives by shocking audiences into new knowledge. The Weather Channel videos have a large potential to educate people through the new IMR technology. They are not too dissimilar from, say, Google’s STEM labs. The Florence weather demo has reached a wide viewership. It sends out a warning visceral enough for anyone to question the danger of Florence hurricane. It is the reaction of the residents that the news reports primarily had in mind. Based on the reaction of the viewership which has largely been rather positive, we can assume that the MR weather demo served its purpose well.